I'm featuring Iron Hill here today for its Pig Iron Porter. Iron Hill has a nearly 25 year timeline based out of northern Delaware sprinkled with a wide variety of beers, awards, tasting and dinner pairing events, people, and expansion. I can't think of many others that have emphasized the intersection of beer and food as consistently as they have and over a longer period of time. And events. The Belgium Comes to West Chester event and the Brandywine Craft Brewers Festival are two that are on Philadelphia-area beer geek calendars every year. In the brewhouse, for quite a while, the stable of brewers was as consistent as you could imagine. Brewer names and faces became as synonymous with Iron Hill as were the owners - Kevin, Kevin, and Mark. But, as time marched on and locations were added - now 16 in total with more on the way - new brewers came in and some shuffled out. Most keep close ties with Iron Hill, but there likely has been no greater training ground in the region for brewers than Iron Hill. The brewery has spawned more than ten brewers as of my last count (probably closer to 15) that have gone on to open their own breweries or be the head brewer at a young upstart. And the awards I spoke of? Many dozens. Again, my awards spreadsheet has lost count at this point, but suffice to say the Russian Imperial Stout stands out amongst them all with at least 14 medals combined between Great American Beer Festival and World Beer Cup. The company is now up to 16 locations, with Rehoboth Beach, Del., Center City Philadelphia, and Hershey, Pa. all opening in quick succession. And, if you weren't paying attention, you might have missed the Greenville, SC outpost opening not long before that. There's much more to their story to tell, but let's get back to the Pig Iron. 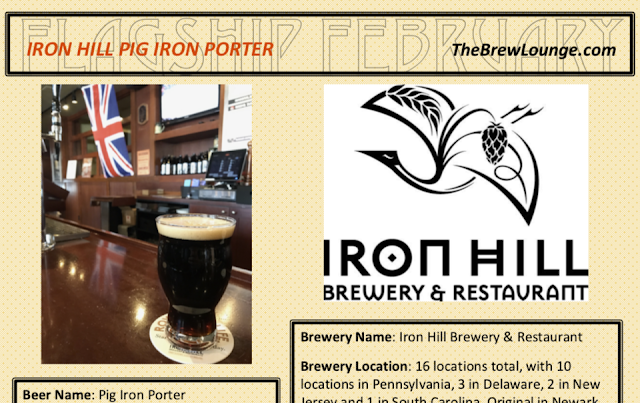 Click the picture below for a full feature on Iron Hill's Pig Iron Porter. Disclosure: For this project, I solely created the list of 28 beers featured here on The Brew Lounge. I was in contact with each brewery and neither required nor requested complimentary samples. I purchased this beer while at the Phoenixville location's British Invasion event.